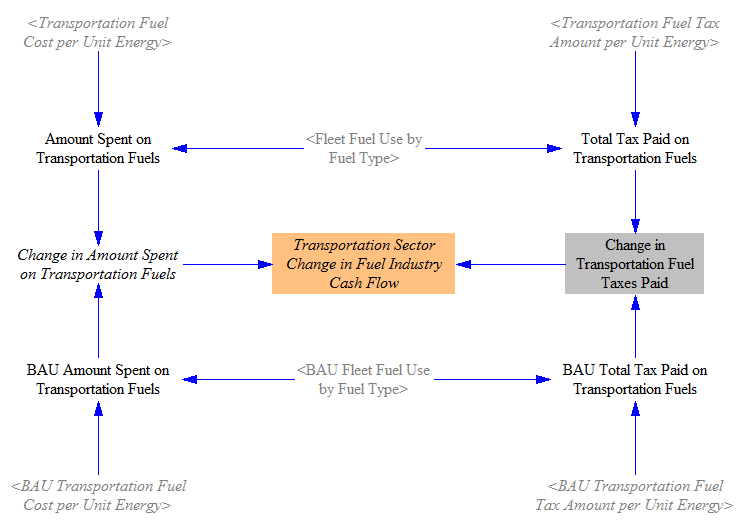 The “Transportation - Cash Flow” sheet calculates the changes in amount spent and received for transportation fuels and for vehicles. Changes in price per unit fuel/vehicle and in quantity demanded are both taken into account. The fleet fuel use by fuel type is multiplied by the fuel cost per unit energy (calculated on the Fuels page) to obtain the amount of money spent on transportation fuels. This value is inclusive of tax. We also multiply the quantity of fuel used by the amount of tax paid per unit energy to find the taxes paid on transportation fuels. These steps are done both for the BAU and the policy cases. We find the difference in the amount spent on fuel taxes, and we find the difference in the amount spent on fuels. We subtract out the difference in taxes to find the cash flow change for the fuel industry (which is subscripted by fuel type). That is, a reduction in fuel spending is a negative cash flow for the fuel industry, while an increase in fuel spending is a positive cash flow for the fuel industry. Policy-related change in spending on vehicles requires a significant amount of additional input data to calculate. 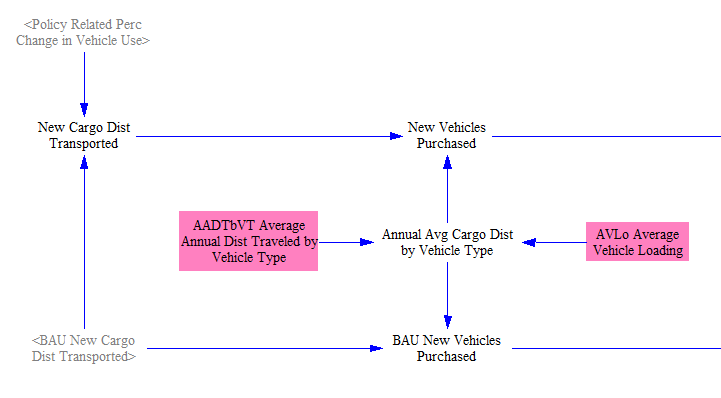 These input data are only available for two vehicle types: passenger LDVs and freight HDVs. 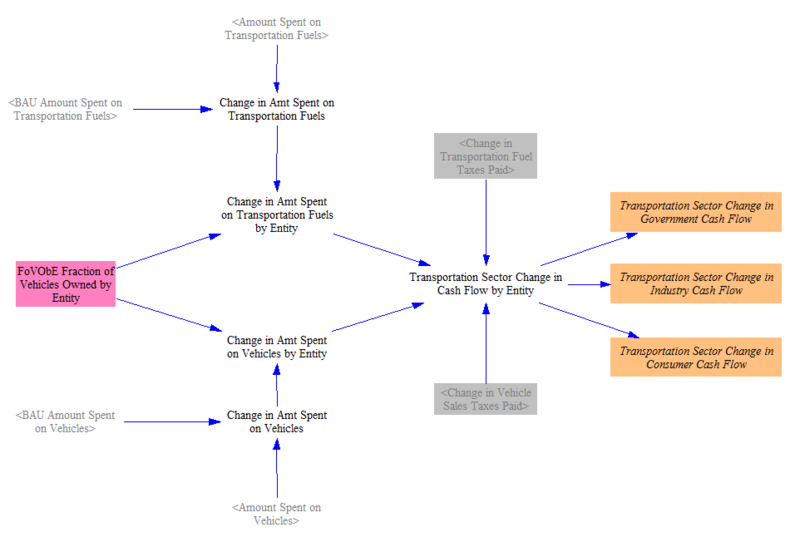 Therefore, the model only calcualtes cash flow changes resulting from differences in spending on vehicles for these two vehicle types. Fortunately, these are the two most important vehicle types, accounting for the vast majority of Transportation sector emissions and likely the vast majority of spending on vehicles each year. “BAU New Cargo Dist Transported” is taken from the “Transportation - Main” sheet. We apply the policy-related changes in vehicle usage calculated on that sheet (based on fuel cost per unit cargodistance transported and on the transportation demand management (TDM) policy lever) to find the “New Cargo Dist Transported” in the policy case. To convert a quantity of cargodistance to a number of vehicles, we need to know the average amount of cargodistance that a new vehicle transports in its first year of service. This is calculated based on the average annual distance traveled by vehicles of each type, as well as the average vehicle loading (typical, distance-weighted number of persons or freight tons carried). This refers to the actual number of persons or freighttons that were carried, not the vehicle’s capacity. First, we adjust vehicle price upward if the carbon tax policy is enabled, based on the “embedded carbon” content of the vehicle. This refers to the amount of carbon (or other GHGs) released “upstream,” during the course of manufacture of the vehicle and its component parts. Those producers had to pay those taxes and likely will pass some or all of the additional cost on to purchasers of those vehicles. (In introductory economics, an individual producer is likely to pass on a fraction of a new tax that is based on the slope of the demand and supply curves for that good. However, in the context of an economy-wide carbon tax- namely, one affecting all producers and all goods- it is likely that this would under-estimate the share of the tax that would be passed on to purchasers, since they would be seeing similar price increases for all goods in the economy, and so would have fewer substitutes or ways to avoid a passed-on tax.) We model this simply as an increase in the cost of the vehicles- as if all of the additional tax were passed on. Lastly, we apply the relevant R&D policy to reduce vehicle costs by a user-specified percentage. For each of the BAU and Policy cases, we multiple the average vehicle price by the number of vehicles sold to find the total amount spent on vehicles. Based on the sales tax rate, we find the amount of taxes paid on vehicles. We take the difference between the two cases to find the change in tax payments attributable to the policy package. We similarly take the difference in overall spending on vehicles. Then we subtract out the difference in sales taxes paid, to find the change in non-tax amount spent on vehicles. This becomes the change in cash flow for vehicle suppliers. That is, a reduction in the amount spent on vehicles is a negative cash flow for vehicle suppliers. Our guiding assumption here is that the fraction of the change in cash flow attributable to each actor is the same as the fraction of all vehicles owned by that actor, calculated separately for each vehicle type. We find the total change in amount spent on fuels and on vehicles, and we divide up this change in spending by actor accordingly. Finally, we add in the tax receipts to the “government” total, and we break out the final numbers into three variables for visual clarity and ease of reporting.